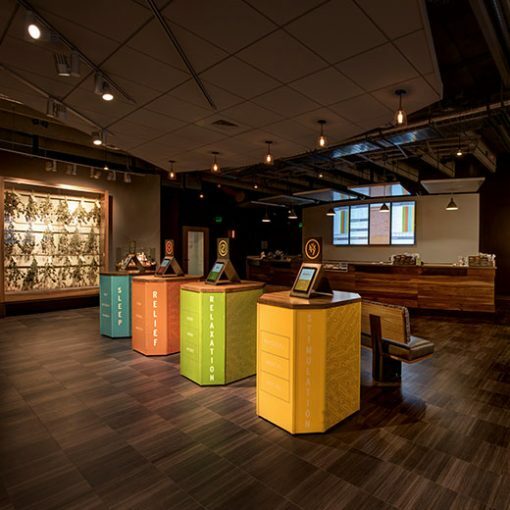 When Good Chemistry, a boutique cannabis cultivator and retailer in Denver, decided to open a store in Aurora, Colorado, founder Matthew Huron wanted to hire a team of architects, interior designers, and brand consultants to transform an old 3,600-square foot Blockbuster into a modern and sleek recreational dispensary. The store, with cool grey walls, wood counters and floors, and splashes of blue, green, orange and yellow, opened in 2015. The design and concept was conceived by Tony Coleman Interior Design, who helped design Panera Bread from the company’s inception, brand strategist Michael Markowitz and Associates, who has worked for Anheuser-Busch, Universal Studios, and Au Bon Pain, and graphic design firm Duffy & Partners, who has helped Minute Maid, Brewery Ommegang, and Wolfgang Puck come up with their brand identities. The result is a welcoming, bright and open layout that separates its 15 home-grown strains of cannabis into four categories of feelings with different strains under each category–relaxation, relief, sleep, and amplify. Each customer can learn about a specific strain on provided iPads, learn about its chemical makeup, its effects, and how it was grown. Huron says the fusion of design and mini-educational centers help new customers navigate the products. 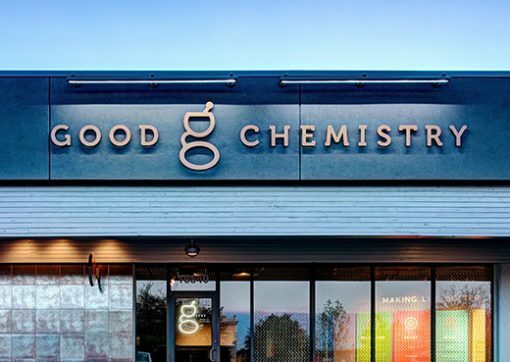 Good Chemistry has a collection of 60 different strains in its nurseries and is constantly updating its menu and product offerings. Read the full article here. Scroll to the bottom to see the Slideshow.